Dozens of demonstrators gathered in front of the Indonesian Embassy in London to initiate the global protest against West Papua’s decades-long isolation, reaching unprecedented levels of worldwide solidarity. The rally took place in a coordinated effort as the “Global Day of Action for Free and Open Access to Papua” in 10 countries and 22 cities around the world on Wednesday [5 May 2015], calling for free and open access to the West Papuan region, and for an end to media blackout and human rights violations. Following the rally, a petition to President Jokowi, signed by more than 47000 people including 52 Papuan, Indonesian and international groups and parliamentarians, was delivered to the Indonesian Embassy in London. Dozens of demonstrators dressed in black gathered outside the Indonesian Embassy in London this week to lead the global protest against West Papua’s 50-year long isolation. The demonstration was organised by TAPOL and Survival International, supported by Amnesty UK and the Free West Papua Campaign. The rally was one of 22 protests around the world on Wednesday calling for free and open access to Indonesia’s most secretive region. Since West Papua’s annexation in 1963, Indonesia has imposed a media blackout on the contested, resource-rich territory, allowing perpetrators of human rights violations to act with total impunity. West Papua is one of the world’s most isolated conflict spots. For decades, Indonesian security forces have brutally suppressed Papuan pro-independence movements. The “Global Day of Action for Free and Open Access to Papua” has sparked rallies in West Papua, Indonesia, Australia, New Zealand, the Solomon Islands, Scotland, Germany, France, Italy and Spain. Protests in Los Angeles, New York and San Francisco also took place after the London rally. This global coordinated effort, the first of its kind, shows that worldwide solidarity for West Papua has reached unprecedented levels. Esther Cann from TAPOL, a London-based NGO coordinating the rally, said: “This is the first time we’ve seen anything like this level of support for West Papua. From the Solomon Islands to Scotland to San Francisco, hundreds of demonstrators from 22 cities in 10 different countries united to call for a free and open West Papua. 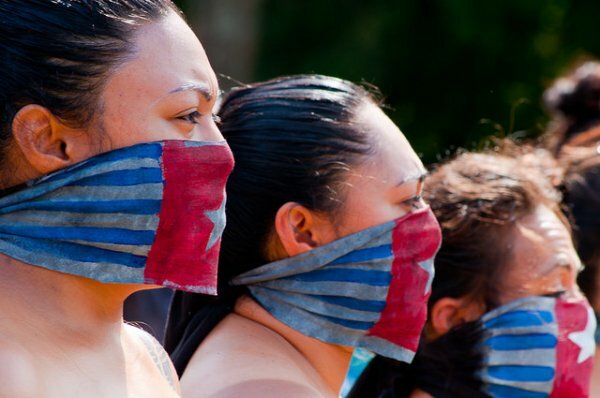 Demonstrators wore black, representing the ongoing media blackout in West Papua. They gathered to demand that President Joko Widodo fulfill his presidential campaign promise of opening West Papua to international journalists, humanitarian and human rights organisations. A three-minute silence was observed to symbolise the silencing of the media in West Papua. At the end of the demonstration, a joint letter to President Jokowi signed by 52 Papuan, Indonesian and international groups and parliamentarians was delivered to the Indonesian Embassy in London. The letter pointed out that “the media blackout denies the Papuan people the right to have their voices heard and allows human rights violations such as killings, torture and arbitrary arrests, to continue with impunity … The de-facto ban on foreign journalists, NGOs and humanitarian organisations contributes to the isolation of local journalists, and makes independent investigation and corroboration virtually impossible”. An Avaaz petition calling for media freedom in West Papua, launched by the Free West Papua Campaign and signed by more than 47,000 people was delivered to President Jokowi by Papuan students in Jakarta today. Reporters without Borders, a co-signatory to the joint letter, criticised Indonesia’s decline in media freedom. Benjamin Ismail, the head of the Asia-Pacific Desk at Reporters without Borders said: “Indonesia’s ranking in the World Press Freedom Index has worsened dramatically in the last four years. Access for UN human rights observers has been closed for eight years. In recent years, international humanitarian agencies and NGOs have been pressured to close their field offices and leave Papua. International journalists and NGOs seeking to visit and work in Papua are currently required to undergo a stringent visa application process involving the unanimous approval of 18 separate government agencies known as the Clearing House committee. In October last year, two French journalists were sentenced to 11 weeks in detention under immigration charges because they had tried to report the Papua conflict. During his presidential campaign, President Joko Widodo publically stated that there was nothing to hide in Papua and promised to open the region. Yet six months into his presidency, Papua remains closed off to the international community. While President Widodo has pledged his commitment to resolve past rights abuses, the execution of eight people for alleged drug trafficking offences less than 24 hours before the London rally put the future direction of Indonesia’s human rights into serious question.